I have been wanting to write about this book for a while now but wasn't quite sure where to start. Long story short, I have been going through some family issues that have rocked my world for a few months now and after sharing a few stories with one of my trusted and loved co-workers, she showed up one day with this book in tow for me. I was actually quite shocked but felted loved and cared for. It was a good feeling so I thought "what the heck?" and dove right in. I am a huge fan of self-help books but usually start them and never finish them. Or I skim them and miss parts here and there - you know how it goes. This one was different though - I made a commitment to read it cover to cover and even got out my old Sharpie highlighter to highlight the parts that I wanted to go back and re-read ... and now half of the book is highlighted in bright orange. Seriously - this book blew my mind. It came to me at exactly the right time and addressed exactly what I was going through in my life. Coincidence? I don't really think so. I quickly learned that I wasn't taught how to create 'boundaries' in my life as a child and that has (way too easily) transferred into my adult life. 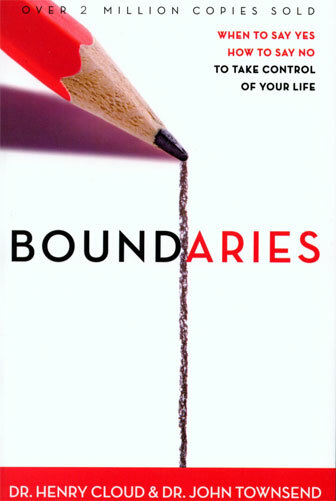 I quickly gobbled up the section on boundaries and the workplace, boundaries and your marriage, boundaries and yourself ... wow! I am shocked by how common sense most of the suggestions were and yet, I went out of my way to avoid certain uses for boundaries on a regular basis. I even have Boundaries with Kids on my Amazon Wish List ready for whenever that time comes! Ha ha - I will be armed and ready :) Now - the only down side for me (and I'm only speaking for me) is that the whole book is centered around the bible and quotes scripture in relation to the common sense ideas around boundaries throughout the book. I had a tough time getting past that (I am not an openly religious person - consider myself more spiritual - and really do not know what I believe or don't believe) but I was - again - blown away by how directly the bible speaks to boundaries. If you are a Christian this book is a must read - and if you aren't a Christian, this book is a must read. That's the point - take what you want and leave the rest but if you are a time in your life where things aren't really clicking, your job isn't making you happy, your marriage isn't exactly where you would like it to be ... read this book. Grab a highlighter and spend a cold night with a hot cup of tea learning. If this book wasn't so entangled with the bible, I would buy it for everyone I know this Christmas - ha ha! I just urge you to take the time for personal growth and development. You can only be better for it. Enjoy friends!